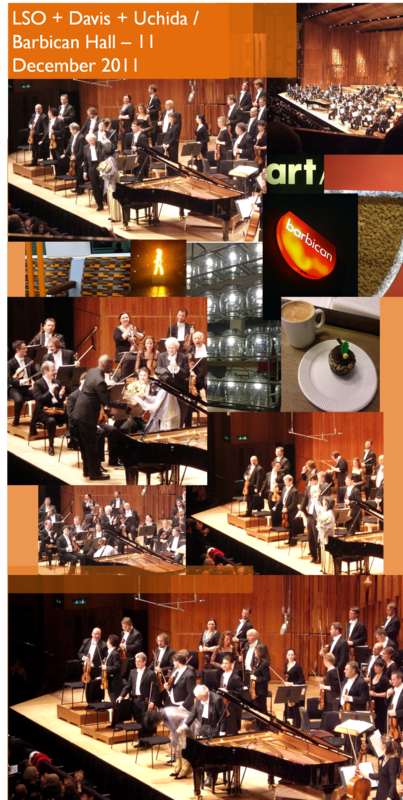 Last night was the first concert of Valery Gergiev and the London Symphony Orchestra of their Berlioz cycle at the Barbican. In keeping with his recent appearances elsewhere Gergiev was greeted by protest in line with his refusal to make any statement in the past few months. About the dire situation in Russia for homosexual citizens or to use the exact phrasing of their law, individuals that spread ‘propaganda of nontraditional sexual relations to minors’. This has led to a reported increase in homophobic bullying and violence. Peter Tatchell reportedly walked on stage last night and denounced VG as a supporter of President Putin before he was removed by security. As much as I admire Tatchell’s record as a human rights campaigner I tend to disagree with any protest that disrupts the run of a concert. But his brand of direct action interventions is part of how he gets press attention to the causes he supports. Tonight is the second concert of the series and I will be in the audience. 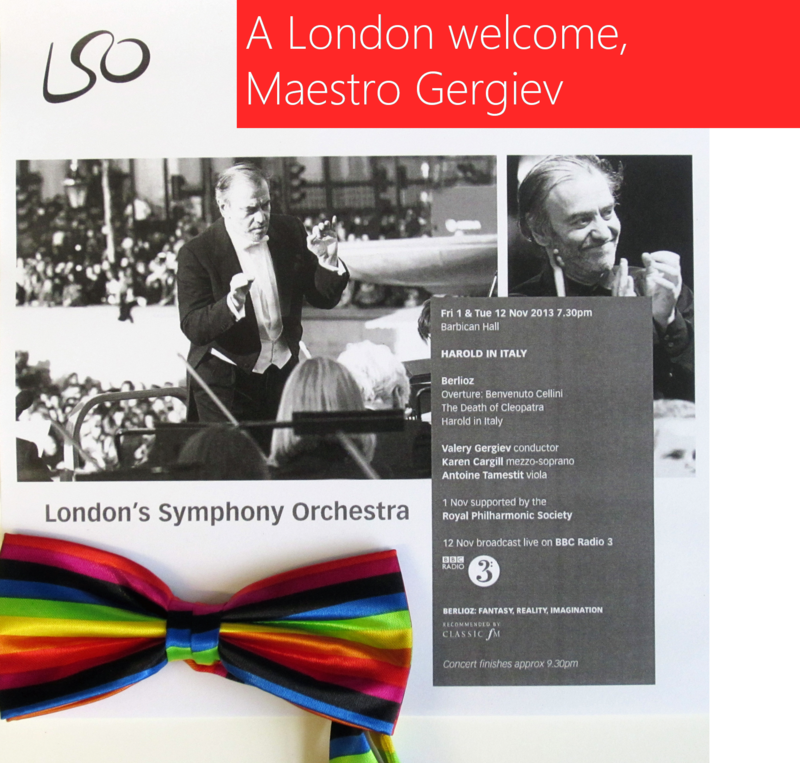 Inspired by the protest at the Met Opera last month during the Onegin première, I will be wearing (not a NYC ribbon) a rainbow bow tie as a well-mannered protest to maestro Gergiev’s insistence to remain silent on this important matter. In light of his high-ranking position within the Mariinsky and his direct political involvement with Putin in Russia, he definitely has and should have a publicly expressed opinion. But he chose to follow the age old damage limitation tactic of staying silent until the storm passes. @OperaCreep Excellent. Yes, please do that. It is up to us in the audience to signify that his behaviour is both poor and cowardly. If you are in the audience tonight and have something rainbow coloured bring it along. I have no appetite to disrupt the performance but also want to make a point, no matter how small or subtle. Of course another option for members of the audience would be to withhold applause. 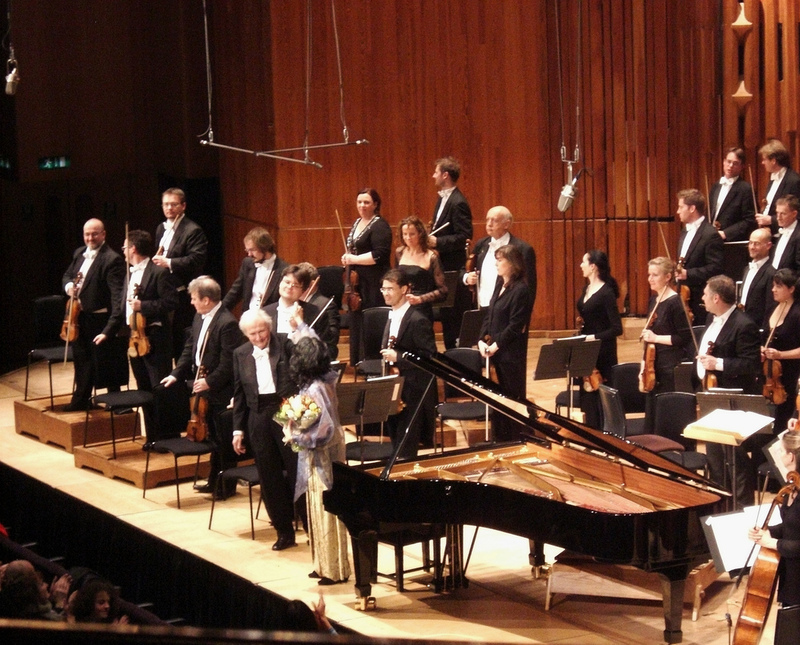 Valery Gergiev has made an official statement on Wed 06 November. Unfortunately it reads like something dragged out of the 1970s with a vibe of ‘My best friends are gay’. But at least it is a small bit of progress. We use the word legend far too easily but applying it to a great maestro of the stature of Sir Colin Davis is very appropriate. In the last decade I had the chance to see him conduct his beloved London Symphony Orchestra many times. Every time their sound had a special sheen that somehow only he could conjure. His contribution to the musical life of this country and all over the world through his many tours and recordings is possibly the most important of the post war era. Unlike many of his contemporaries his quiet dignity from the podium was for me his unique characteristic. In the concert hall he radiated calm concentration and gravitas. The attention was not focused on an egomaniac maestro but to a musical family coming together. Last June’s absolutely spellbinding Berlioz Grande Messe des Morts was an incredibly moving evening of music making. A family friend had died the same day and in my head I dedicated the stellar performance to his memory. I decided not to put into writing how it affected me that evening as it all felt very raw. Almost a year later it is a sad realisation it was also the last time I saw Sir Colin conduct but also a great last memory to have. A man who made music his life, conducting a composer that he single-handedly brought to contemporary focus and championed like no one else. This was the final farewell to his life’s work and a chapter of music history was written. 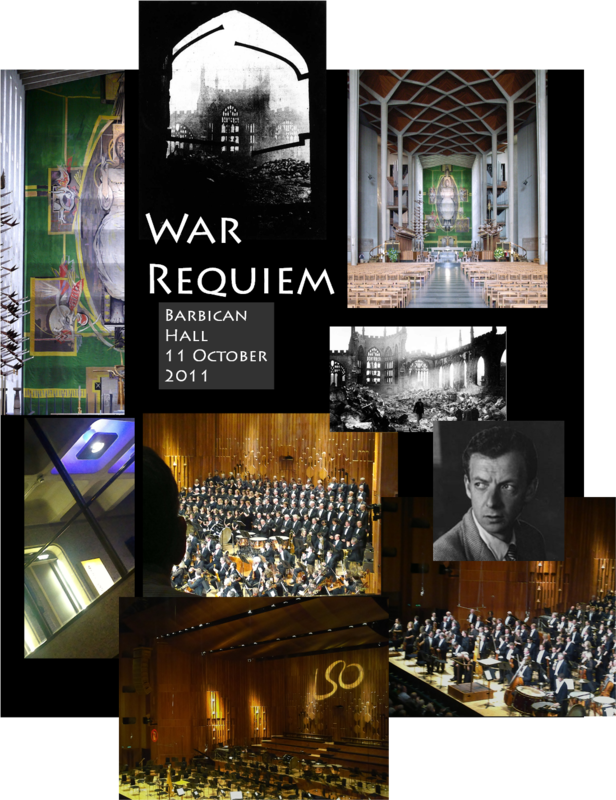 Only last month the recording of those two performances at St Paul’s was issued. I will play my copy in memory of a great evening and a consummate musician that touched all our lives and will continue to inspire us for as long there is recorded music, rest in peace Sir Colin. You will be sorely missed and this Tuesday’s The Turn of the Screw performance will have a special poignancy knowing that you were meant to have conducted it. PS I will giggle for ever more with Sir Colin’s response to my tweet when he was being interviewed in 2011 by Gareth Davies. Of course I had to ask about knitting 😉 His response is near the 14minute mark. 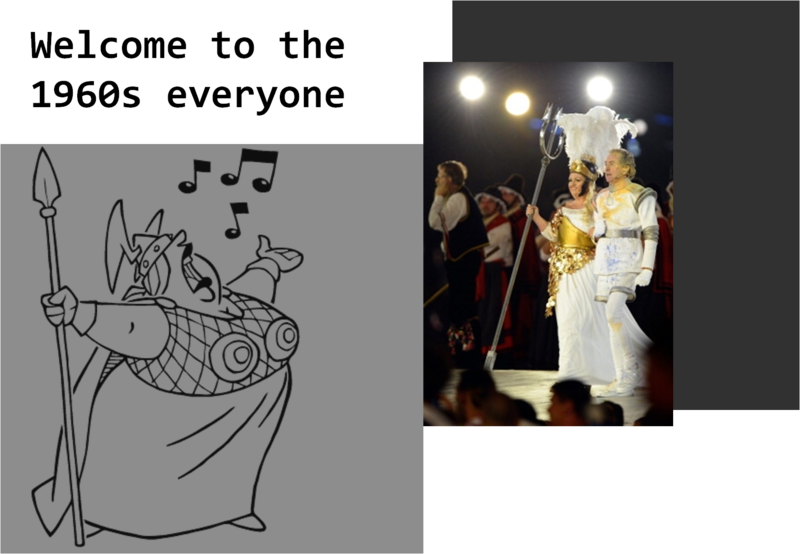 I am not delusional to expect unadulterated opera or classical music in a mass entertainment event like the Closing Ceremony, but seeing an artist of the stature of Susan Bullock as a ridiculous be-feathered “Brunhilda” next to Eric Idle was edging on the insulting. It was near an admission that opera is this desperately irrelevant, form of music that is only good for visual jokes that involve shields and a plumed helmet. Many of Bullock’s colleagues on Twitter thought it was “cool” and “fun” but what image of the opera world did this appearance dissipate? Being able to laugh with the art form and all its impressively out of date attributes is a healthy reaction to a fast, digital world that doesn’t feel it has enough attention span to sit through a whole Ring. But when that one appearance in a three hour ceremony is the only presence of opera as a genre it becomes more problematic. Bullock was embodying the popular cliché of the trident armed high singing soprano additionally surrounded by roller skating nuns and traditional Indian dancers. The whole ‘Always look on the bright side of life’ segment can be discarded as a bit of throwaway comedy that Britain is so great at producing but it should also be seen as a projection of the lack of self-assurance in the part of the opera world to allow its very credibility to be trashed in front of a billion TV viewers. It made for depressing viewing and made me seriously uncomfortable that this was seen as entertainment in 2012. A missed opportunity to show any other genre except for pop/rock that is disproportionately monopolising those type of events. The 1992 Olympics managed to have Montserrat Caballé sing the barnstorming Barcelona with Freddie Mercury which presented an operatic voice as an awesome instrument, measuring against a great rock vocalist. It may have been light on concept but it surely was presenting a more cultured face for Spain than the cheap joke route Britain took last night. Unlike with Caballé’s performance I can’t imagine anyone this morning looking up what opera is on Google. The other two chances for less mainstream culture to feature prominently were also missed, the LSO were not even credited in the broadcast, while the Royal Ballet danced as a circus troupe with a long retired head that was there on the back of some reality TV few years back (sorry Darcey, a decade ago you were great). Andrew Mellor wrote this scrappy piece for the New Statesman clutching at straws on how to substantiate his own prejudices of what classical/opera audiences are like. The main thrust of his argument is the adverts in a BBC Proms programme advertising private tuition etc. He seems to go on some semiotic reading of the adverts and awarding the crown of elitism and high snobbery to the audience. His views are so far apart from my experience that I feel compelled to shortly write about them. I grew up in Athens and was schooled there, the only fancy paid for tuition I received being my rather good English language school (for two hours after school, three times a week). Went to a few opera and ballet performances with my best friend to the disapproval of my parents. That was mainly due to the beautifully appointed Athens Concert Hall (Megaron) and its very cheap student standby scheme which we took advantage of to see some wonderful shows. It was a way in to a world I had very little contact with through my parents or my school (which had only rudimentary music classes, mainly dealing in history). When I moved to the UK fifteen years ago I went to pop concerts, ballet and theatre. Never felt that any venue was out of reach or that the audience was unfriendly. Eventually I went to some classical and opera performances and again never felt patronised or awkward. When I took on a summer job at the Royal Albert Hall as a Steward for the 2000 Proms, it was a great opportunity to be exposed to a huge variety of events and more importantly the love of the musicians and the Hall’s staff for music. This was an eye opener, being part of what felt like a big family, one night being lucky enough to see Tasmin Little with Simon Rattle and the next Petra Lang and Kurt Masur. Never for a second did the adverts in all the programmes that I read felt as a coded cry of the upper echelons of society telling me I was not welcome. What I felt being around all the other Stewards at the RAH and the audience was a great love and respect for the art form and the chance to be exposed to greatness, it had nothing to do with social rank or how I pronounced my vowels. In fact the only time I was exposed to unpleasantness was during a concert by Oasis and their horrible audience. In the last five years I have been taking my partner to lots of performances of music, dance and opera and he possibly would be the one to confirm that we have never felt unwelcome to any venue. Even if some contemporary opera doesn’t totally rock his boat, he takes a lot of pleasure from the sojourns and deepening his knowledge of repertoire and musicians. 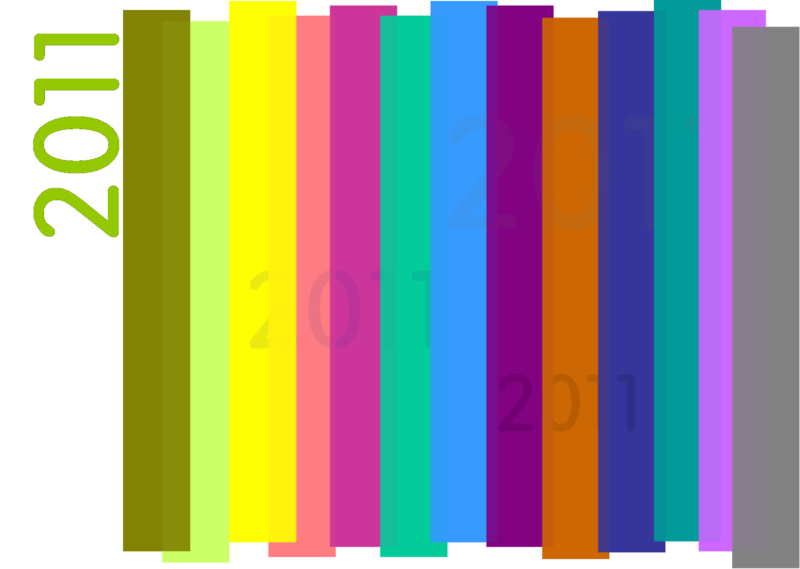 Additionally the advances in social media, the exchanges with orchestras, venues and artists have created a much tighter, warmer bond. 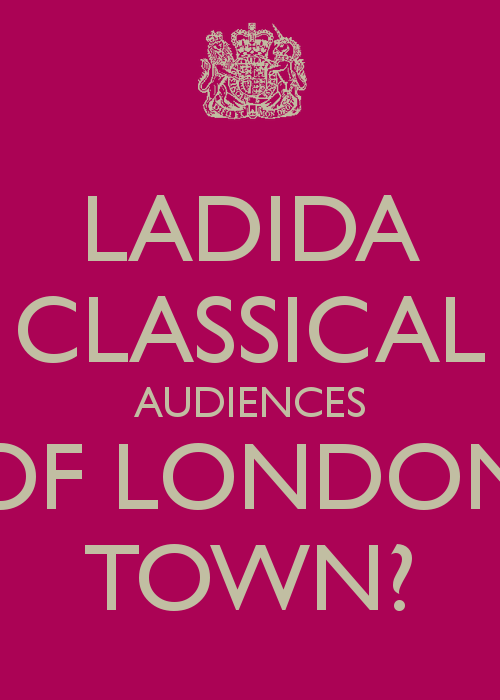 We all know that opera and classical will remain in the fringes of mainstream culture, but orchestras like the London Symphony Orchestra, the Orchestra of the Age of Enlightenment, the English Chamber Orchestra, the Philharmonia Orchestra and many more are using their resources to promote their work and to make appreciation of it as wide as possible. The fact that the LSO will not be as popular as any given pop/rock act doesn’t make them a failure. Most of the time the concept of exclusivity and high cost is foisted on those venues, but it’s far from the truth. 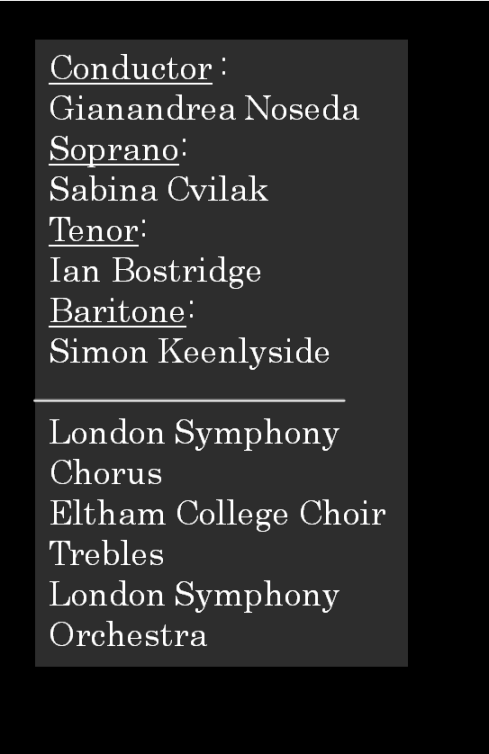 Tickets for the LSO at the Barbican can be had from £8 and that is to listen to one of the most accomplished orchestras in the world with some very illustrious conductors and guest artists. I have been to many concerts where the food consumed at the cafe was more expensive than the tickets for this apparent elitist pursuit. Equally there is no buzz like it when a favourite opera singer has a great night. No matter if I’m occupying a top price seat at Stalls or a £15 one at the gods of the Royal Opera House or ENO the deep sense of pleasure and satisfaction is the same. Last week when I was watching Les Troyens from the cheapest seat in the House I was flanked by two people in the polar opposites of the audience. The lady on my right was wonderfully chatty and telling me about performances she had seen and what she was going to next. The gentleman on my left was clutching his opera companion with religious fervour while emanating the unpleasant smell of someone that hadn’t had a wash in a few days and refusing to engage with anyone around him. Was it the Royal Opera’s fault that this chap goes to performances and that he may put off some newcomers? Are newcomers to opera such scared, fragile little things that can’t fend for themselves? Those 5hours 22minutes spent in the company of those two people either side of me it was a metaphor for the larger world surrounding live performance. There are the sweet, obliging, polite, warm hearted, generous people and then there are the less giving, passive aggressive, unpleasant individuals and anything in between the two. As in every other walk of life we learn to co-exist and trying to get on. When the calling of the great music is strong, nothing can mar the experience not even a very smelly, passive aggressive chap on my immediate left. So let’s stop victimizing the classical/opera circuit which is much more democratic and egalitarian than many other sections of British society. I am happy not to be part of an exclusive reception for the sponsors of a concert and I don’t feel excluded or let down, after all they subsidise my hobby. Live and let live. PS The ultimate satisfaction I derive from my blogging and Tweeting activity is when one of my readers/followers decides to give opera or orchestral music a go. Sometimes it just takes that one visit and a love affair that lasts a lifetime begins. That is the very reason why I refuse to be negative for the future of “serious music” and opera, as long as there’s curiosity there will be audiences. Ah the LSO! It can deliver unimaginable riches on a random Thursday evening, like last night. Under the baton of Robin Ticciati they sounded like a different orchestra, all lightness and bounce. Of course from my very cheap seats I could only see his legs moving about and I presume it was a very physical display from his upper body. Something one has to expect by a lean 29 year old. Clearly their very recent trip to China may have invigorated them for a sparkly homecoming. The Strauss was utterly beautiful, the tempi reserved and being at the cheapest seats on front row, we got a real treat hearing at such proximity some gorgeous tremolos from the double basses. A shame really that that very proximity meant that we could also hear a mobile phone going off backstage which was very annoying! The all too important bursts of percussion were thunderous and mournful. It was gorgeous and a great opener to the evening. Christopher Maltman’s Mahler was so beautiful and measured, as near as it gets to lack of ego on a big stage. His dry resonant baritonal voice was in full command of the requirements. His emotional investment all too clear to see and hear. Ticciati quote in the programme on Maltman ‘He brings a kind of lieder-esque quality in his emotional response to music…’ was spot on, he imbued colourful, suitably subdued singing with emotion and sensational beauty. 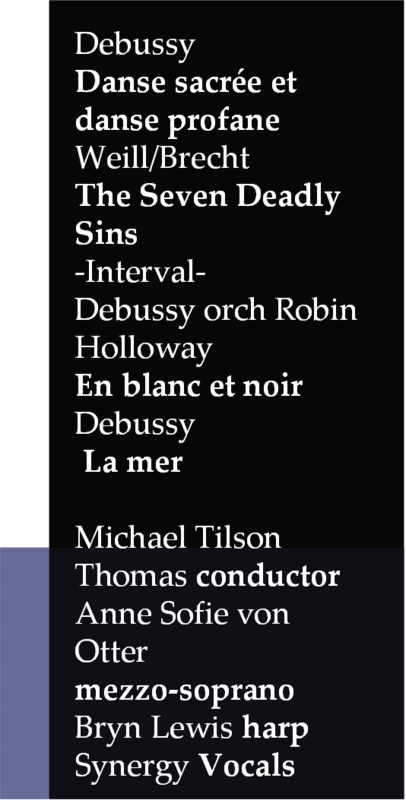 This was a truly accomplished performance with great attention to the text but also with a good ear for the orchestra. 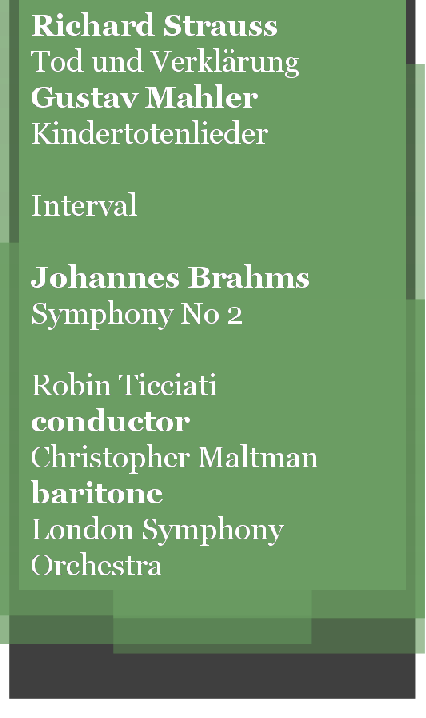 Ticciati kept the volume of orchestra and voice at the same volume which gave the piece a more intimate feel in contrast to the two other items in the programme. Seeing Maltman walk past after the end with tears in his eyes was as moving as his singing. I will surely be looking forward to seeing him again in concert and opera. The band was clearly happy with the loud response from the audience and we all were extremely proud of them. Now if only the in between movements breaks we were not faced with a wall of coughing, life would be even better. The LSO showed its worth once more and I hope they will be booking Ticciati many more times in the near future, as the chemistry is clearly very potent.